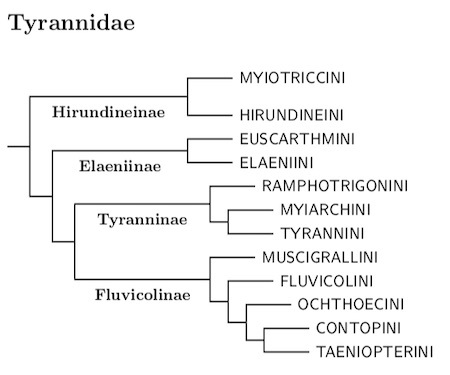 Even though they have been reduced from their traditional size, mainly by losing the Rhynchocyclidae, the Tyrannidae remain the largest of the suboscine families The Tyrannidae include about one quarter of all of the suboscines. Although Ohlson et al. (2013) estimate that the Tyrannidae have been a separate lineage since roughly 25-30 million years ago (mid-Oligocene), the current diversification of the group dates to the last 20 million years. The tyrant flycatchers remain among the most difficult to classify and identify, full of cryptic species. Some flycatchers are so cryptic that there remains controversy about whether 1 or 2 species are involved, such as the the Cordilleran and Pacific-slope Flycatchers. The new slimmed-down Tyrannidae have a simpler structure than the old Tyrannidae. There are three major and two minor clades designated as subfamilies. The first subamily is Hirundineinae. This is a small subfamily containing only 6 species. Ohlson et al. (2008) considered this group closest to the Tyranninae and Fluvicolinae. In contrast, Fjeldså et al. (2018) and Tello et al. (2009) found them sister to the Elaeniinae. Rheindt et al. 's (2008a) data put them in a more basal position, sister to the combined Elaeniinae, Tyranninae, and Fluvicolinae. For now, I'm following Ohlson et al. (2013) which puts them in a basal trichotomy with the Elaeniinae and a clade containing the other three subfamilies. Note that the three former Myiophobus included in this subfamily are not closely related to the rest of Myiophobus. They have been given a new genus name, Nephelomyias, by Ohlsson et al. (2009). The second subfamily contains the Elaenias (Elaeniinae). It has two major branches: Euscarthmini and Elaeniini. Ohlson et al. (2008) and Tello et al. (2009) find very similar results for the Euscarthmini. Rheindt et al. (2008a) is a bit different, but not very strongly so. Sixteen species of Phyllomyias tyrannulets are separated from the main Phyllomyias group (part of Elaeniini) and placed variously in the revived genera Tyranniscus and Xanthomyias. I've also included five tyrannulets from Mercocerculus in Xanthomyias. It's not clear whether these two groups are sisters or nested, and it seemed best to treat them as one genus for now. This reduces Mercocerculus itself to a single species which belongs in Elaeniini. The arrangement of species within Zimmerius is based on Rheindt et al. (2008c, 2013). Based on Rheindt et al. (2013), Mistletoe Tyrannulet, Zimmerius parvus, Specious Tyrannulet, Zimmerius improbus (inc. tamae), and Venezuelan Tyrannulet, Zimmerius petersi, are split from Paltry Tyrannulet, Zimmerius vilissimus. Coopmans's Tyrannulet, Zimmerius minimus, comprising minimus and cumanensis has somewhat speculatively been split from Golden-faced Tyrannulet, Zimmerius chrysops, based on comments in Rheindt et al., (2013). I continue include the Loja Tyrannulet, Zimmerius flavidifrons. Rheindt et al., (2014) describe a mosiac population that is linked to both the Golden-faced and Peruvian Tyrannulets. It includes flavidifrons and an undescribed Peruvian population and may end up being lumped in with the Peruvian Tyrannulet. Thus the old chrysops with 5 subspecies has been divided among Coopmans's, Choco, Golden-faced, and Loja Tyrannulets. Finally, Chico's Tyrannulet, Zimmerius chicomendesi, newly described by Whitney et al., (2013c), has been added to the list. The situation in the Elaeniini is rather complicated, with different analyses giving quite different results. There are five groups, and once again, I rely on the multi-gene analysis of Ohlson et al. (2013) to resolve their order. The clades start with (1) the Tyrannulus and the Myiopagis elaenias and (2) the Elaenia elaenias. These form a trichotomy with a clade consisting of the remaining three groups: (3) Suiriri; (4) the Capsiempis-Phyllomyias group; and (5) the Pseudelaenia-Serpophaga group. See Ericson et al. (2006b), Ohlson et al. (2008), Rheindt et al. (2008a), and Tello et al. (2009) for alternative treatments. The Chapada Flycatcher, Suiriri affinis, is unrelated to the other Suiriri taxa and has been moved to Fluvicolini. Zucker et al. (2016) found that Nesotriccus is embedded in Phaeomyias and that both are very closely related to Phyllomyias. Accordingly, I have merged Nesotriccus (Cocos Flycatcher) and Phaeomyias into Phyllomyias. It would not be unreasonable to go a step further and merge the monotypic Capsiempis with Phyllomyias. However, both names have equal priority and need a first reviser action to decide between them. Since there's not a strong need to merge them, it can wait. Also based on Zucker et al. (2016), the Mouse-colored Tyrannulet, formerly Phaeomyias murina, has been split into Amazonian Mouse-colored Tyrannulet, Phyllomyias murinus, including wagae, and Northern Mouse-colored Tyrannulet, Phyllomyias incomtus, including eremonomus. Straneck's Tyrannulet / Gray-crowned Tyrannulet, Serpophaga griseicapilla, has had a somewhat checkered history. It was previously referred to as Serpophaga griseiceps, but the type of griseiceps was actually a juvenile of S. munda (Herzog and Mazur Barnett, 2004). Straneck (2007) gave it the name S. griseiceps. It has also been referred to as Gray-crowned Tyrannulet, and Monte Tyrannulet. This brings us to the clade including Fluvicolinae, Tyranninae, and the Short-tailed Field Tyrant, Muscigralla brevicauda. The last has long been a controversial species. Some have even suggested it is an ant-thrush, while others have argued it should be merged into Muscisaxicola (for a discussion, see Lanyon, 1986). DNA analyses are not immune to this controversy. Ohlson et al. (2008) located it basally in Fluvicolinae, and Tello et al. (2009) used a different set of genes to place it basal to both Fluvicolinae and Tyranninae. The combined analysis by Ohlson et al. (2013) agreed with Tello et al. At the other extreme, Chesser (2000), using a third set of genes, found it sister to Muscisaxicola, and there was evidence they should be merged! Finally, Fjeldså et al. (2018) have two solutions, either basal to both Fluvicolinae and Tyranninae (Figure 2), or basal in the Tyranninae (Figure 1). After examining the table of genetic distances reported by Chesser, I doubt whether Muscigralla is all that close to Muscisaxicola. I have placed it in a trichotomy with Fluvicolinae plus Tyranninae. The treatment of Tyranninae follows Ohlson et al. (2013), which analyses all of the genes considered in both Ohlson et al. (2008) and Tello et al. (2009). Within Tyranninae, the attilas are basal, followed by the Piratic Flycatcher (Legatus), and the Ramphotrigon flatbills (including Deltarhynchus). The remainder of Tyranninae is divided into a Myiarchus group and a kingbird group. There were some differences between Ohlson et al. (2008) and Tello et al. (2009). I'm following the resolution of these differences proposed in Ohlson et al. (2013), but we should keep in mind that some of the genes are telling incongruent stories and that additional information may change some of the details. I've put the Lesser Kiskadee in Philohydor as it is not certain that Pitangus is its closest relative. They are sister species in Tello et al. (2009), but the support is not great and Chaves et al. (2008) has them separated. I've also separated the Fork-tailed Flycatcher in Milvulus based on Tello et al. (2009). Once it is out of Tyrannus it reclaims its old name and becomes Milvulus tyrannus, not Milvulus savana. The arrangement of Myiarchus is based on Joseph et al. (2004) and Sari and Parker (2012). They both note some issues within Myiarchus. They may represent incompelete lineage sorting, species boundaries that need to be redrawn, or even cryptic species. One such involves La Sagra's and Stolid Flycatchers, which seem to be mutually paraphyletic (Joseph et al. 2004). Other such problems exist for ferox, phaeocephalus, swainsoni, tyrannulus, and tuberculifer. Also within the Myiarchus group, Sirystes, Sirystes sibilator has been split into: Sibilant Sirystes, Sirystes sibilator, White-rumped Sirystes, Sirystes albocinereus, Todd's Sirystes, Sirystes subcanescens, and Choco Sirystes, Sirystes albogriseus, based on Donegan (2013). Based on Garrido et al. (2009), the Loggerhead Kingbird has been split into three species: Western Loggerhead Kingbird, Tyrannus caudifasciatus, Hispaniolan Kingbird, Tyrannus gabbii, and Puerto Rican Kingbird, Tyrannus taylori. The three are easily distinguished by their calls, or with a little care, by their plumage. I now follow Fjeldså et al. (2018) for the Fluvicolinae, in preference to Ohlson et al. (2013). In contrast, Ohlson et al. (2008) and Tello et al. (2009) obtain different concerning the Fluvicolinae, with Tello et al. much closer to the more recent Ohlson et al. (2013). In particular, I use Fjeldså et al. to position Colonia and (true) Myiophobus, hoping that the denser taxon sampling does the trick. I now split the Fluvicolinae into four tribes, corresponding to Fjeldså's clades A through D.
The Fluvicolini come first. There's been some minor rearrangement and a few additions. Following Fjeldså et al. (2018), I've included Colonia here, as well as the Black-and-white Monjita, now called Heteroxolmis dominicanus, previously in genus Xolmis. There is one other addition. The Chapada Flycatcher, formerly Suiriri affinis (not S. islerorum, see Kirwan et al., 2014a) is not related to Suiriri. Rather, Lopes et al. (2018) found it is sister to Sublegatus. Lopes et al. established a new genus for it, Guyramemua, so the Chapada Flycatcher becomes Guyramemua affine and moves from Elaeniini to Fluvicolini. The second branch is the chat-tyrant clade unofficially called Ochthoecini. Fjeldså et al. confirm the arrangment of genera. Silvicultrix is separated from Ochthoeca (see García-Moreno and Arctander, 1998) and several of the former Myiophobus are temporarily designated “Myiophobus” (years later, we still await a proper name). Moreover, Tumbezia has been merged into Ochthoeca, with Ohlson et al. (2013) pushing me over the line on this. There is still some guesswork in the arrangement of this group, but at the generic level is agrees with Lanyon (1986). I have split the Blackish Chat-Tyrant, Ochthoeca nigrita, and Maroon-belted Chat-Tyrant, Ochthoeca thoracica, from the Slaty-backed Chat-Tyrant, Ochthoeca cinnamomeiventris, based on a combination of Fjeldså et al. (2018), Ridgely and Greenfield (2001), Hilty (2003), and Garcia-Moreno et al. (1998). The Contopini follow Cicero and Johnson (2002), Ohlson et al. (2008, 2013) and Tello et al. (2009) telling the same basic story. The only real disagreement concerns whether Sayornis and Mitrephanes are sister taxa. Note also that the true Myiophobus are basal in Contipini. Finally, Empidonax taxonomy follows Cicero and Johnson (2002) and Johnson and Cicero (2002). However, Fjeldså et al. (2018) have called this into question. Their phylogenies suggest that Empidonax is not monophyletic. Support for this is weak, but further data may force a change here. The treatment of the Xolmini now follows Fjeldså et al. (2018), replacing Ohlson et al. (2013), the very similar Tello et al. (2009) and the slightly different Ohlson et al. (2008). The more complete taxon sampling by Fjeldså et al. has forced a split-up of the genus Xolmis. Besides sending the Black-and-white Monjita to the Fluvicolini (Heteroxolmis), The Fire-eyed Diucon, now Pyrope pyrope, moves to Pyrope. I've also moved the Black-crowned Monjita, Neoxolmis coronatus, Rusty-backed Monjita, Neoxolmis rubetra, and Salinas Monjita, Neoxolmis salinarum, to Neoxolmis from Xolmis. Finally, the Gray Monjita, now Nengetus cinereus, has been placed in Nengetus (Swainson 1827). It had historically been in the genus Taenioptera (Bonaparte 1825), of which it is the type. However, although Bonaparte alluded to Taenioptera as a subgenus in 1825, he did not actually establish the name until 1831. Thus Nengetus has priority. The order in Anairetes and Uromyias is based on DuBay and Witt (2012) and Roy et al. (1999). DuBay and Witt use additional genetic information to argue that the two Uromyias species (agilis and agraphia) form a clade sister to the rest of Anairetes, contrary to the conclusions of Roy et al. (1999). Whether to treat them as one genus or two is a matter of opinion. The SACC has endorsed using two genera. The arrangement of the Knipolegus black-tyrants is based on Hosner and Moyle (2012) and Fjeldså et al. (2018). Since Eumyiobius would be embedded in Knipolegus, it has been merged into Knipolegus. Hosner and Moyle's results provide support for treating Caatinga Black-Tyrant, Knipolegus franciscanus, as a separate species from White-winged Black-Tyrant, Knipolegus aterrimus, and also Plumbeous Tyrant, Knipolegus cabanisi, separate from Jelski's Black-Tyrant, Knipolegus signatus.